Honeybees can be found all around the world but nowhere are they more valued and respected than in Slovenia. 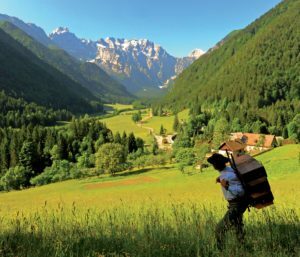 Here’s a remarkable comparison: There are an estimated 8,000 beekeepers in Slovenia, with a population of less than 2 million, while Canada, with 37 million, has 7,000 beekeepers. Slovenia is truly a nation of beekeepers! 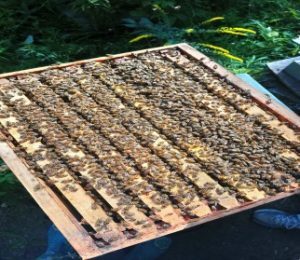 As well, while many residents in Canada are fearful of keeping bees on their properties, in Slovenia, it is common practice for people to have backyard hives. There is a long history of apiculture associated with Slovenia. The old saying: “beekeeping is the poetry of agriculture” originated with its residents. Slovenian Anton Janša was regarded as the first teacher of modern apiary. Now, his 1734 birthdate is honoured via the Slovenia driven proposal to have May 20th declared World Bee Day within the framework of the United Nations. Perhaps the most famous Slovenian beekeeper was Anton Žnideršič (1874-1947). He developed the AZ hive house and box that is now widely used in his native land. 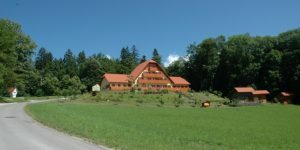 Why the current buzz in Slovenia? Most of Slovenia has a continental climate with cold winters and warm summers, ideal for the native Carniolan honeybee. However, the weather and large vegetated tracts are not enough to create the buzz. Modern, active efforts are made to not only have honey enjoyed by its citizens (monthly traditional breakfasts for primary students) but also to promote tourism. 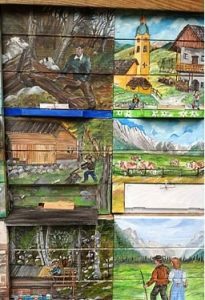 People travel to Slovenia to see unique hive architecture, experience honey-tasting tours and enjoy the beauty of unique Slovenian folk art paintings on hive panels that cannot be found anywhere else in the world. Above is a picture of an AZ hive house with stacked beehive boxes. The picture on the right reflects how Slovene beekeepers take great pride in the decoration of their hives which may include biblical images or pictorial representations of their family history – working on the land, their local church, marriage, livestock etc. When I became a beekeeper in 2015, I read a lot about how the honey bees were struggling to survive. There are many theories to explain this phenomenon, however, it is commonly agreed that the human use of pesticides and herbicides is a significant contributing factor. I wanted to create a clean environment for our hives, free of these harmful agents. 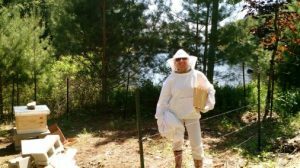 Since then, my husband, two daughters and I have shared many memorable experiences in beekeeping. It has been a tremendous learning experience for all of us. In early 2018, we started accepting invitations to present our apiary story to church groups and community organizations. Since then, we’ve spoken to several other church groups and community organizations. Our audiences have been very engaged and inquisitive. It is an honour and a privilege to be able to educate others on these fascinating and vitally important insects. We continue to learn about bees, though, and perhaps more importantly … from them! Honey bees are living examples of community, united in their purpose – survival and procreation. Each bee lives approximately 45 days. During their short life, they have different roles and can change to whichever task is necessary i.e. nurse bee, guard, cleaner, forager etc. While the honey bee often works alone in their individual role, they always come together as a team. I have observed bees on the return to their hive after a day of foraging, landing on the entrance platform to be greeted by another bee to help take the nectar and store it into the hive. The honey produced by one generation of bees will be used to sustain future generations, ensuring the continuing survival and flourishment of the hive. Now, could you imagine what a beautiful world, and what a different world this would be if we all worked not for ourselves but for each other? Rather than worrying about collecting and accumulating more for our own enjoyment, let’s focus on how we can better serve the environment and future generations. Our purpose should be as honeybees, to leave our world in a healthier state for sustainability and enjoyment, to leave it in a way that God first created it – abundant and beautiful. God sets a unique passion in each of us. For my family and I, this passion is about environmental protection and reminding people that we are all stewards of the earth as God calls us to be in Genesis 1:28. 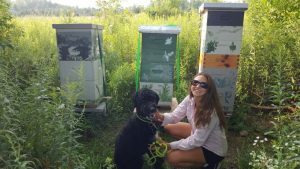 For more information on The Bees Knees Apiary, contact Julie Ginter at beesknees170@gmail.com. Jones, Richard (2013). 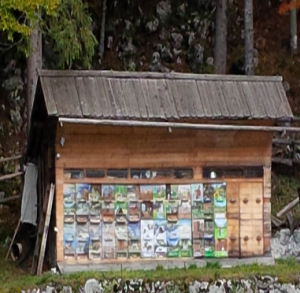 The Folk Art of Slovenian Hive Front. International Bee Research Association.